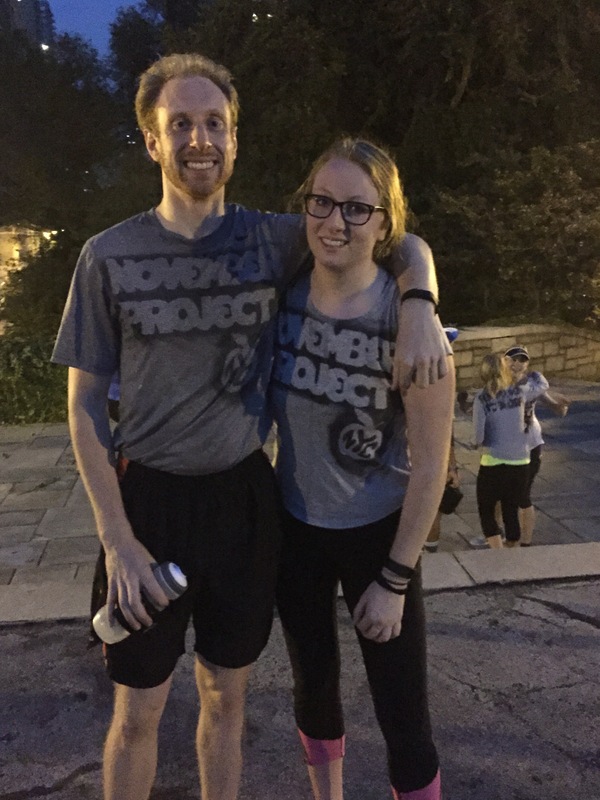 10/7/2015: Morning Run: November Project PR DAY YAYAYAYAY! I hit the gym and did my leg day routine, which consists of: 1) leg press; 2) abduction machine; 3) adduction machine; 4) glute press; 5) hamstring curls; and 6) squats, usually with a kettle bell pressed to my chest. I also stretched a bunch, and then I ran 6.2 miles after work. Leg day always falls on a running day, but as I’ve been doing it this way for a couple months, my body is used to it. Of course, PR day doesn’t always fall on the day after leg day plus run day, but no matter! When it comes to NP_NYC, you #justshowup and hit the workout hard. I knew that this would be my second to last high intensity run before the NYC Marathon (the other being the Staten Island Half coming up on Sunday! ), so I planned to give it my best effort. My first run on the course on last month’s PR day netted me a 22:34. I was hoping to break 21:00 this time. A quick explainer: The first Wednesday of each month is NP_NYC’s PR day. We run eight loops of a course in Carl Schurz Park on the east side, which makes for a 3.5ish mile run. The goal is to improve every month and earn a PR. Very straightforward. The course itself is mostly flat except for two sets of stairs at the end of each loop. As I’ve discovered both times I’ve run the course, the stairs really slow the run down. NP_NYC had a surprise for us this PR day: Strava had helped the group create a race within their app, so we could track our individual and team results by logging the run with the Strava app. I dislike running with my phone strapped to my arm, but went for it anyway. I thought it would be cool to see everyone’s results. After Lew got us going with the bounce, we lined up and John started the timer. Boom! We were off. I ran the first two loops with Myles, a strong runner who unofficially manages NP_NYC’s NYRR running team efforts. Myles and I tried to make small talk, but I was in the zone pushing hard and not exactly capable of continuing a conversation. Myles pushed the pace after the second loop, and I ran the rest of the way by myself. I view this run as a great example of my mindset during most races. First, I charge out of the gate, ready to conquer everything and everyone. After a couple of laps, I settle into a groove, and usually slow my pace down. Once I sense the end is near (in this case, the last two laps) I pick up the pace again and fight hard to the finish. This mirrored my efforts from this morning, except that I pushed so hard during the first three or four laps that I had trouble finding that extra push in the last two laps. My legs screamed and I had to fight through some negative thoughts to keep on moving. I crossed the finish line with a time of 21:07 (John said 21:02 when I crossed, but Strava tells me 21:07, so I’ll go with that). Not quite my goal, but damn close and a solid effort overall. At the end of the day, whether I meet the goal or not isn’t the most important part. I felt great because I gave the run a strong effort, and remembered that no matter how much I’ve improved over the past few months, I can still get better. We keep improving one step at a time. Woohoo! I hung out and cheered on the rest of the Tribe, all of whom were crushing the course. My sister ran what I think were her fastest mile splits ever, which was great. I ran with her for her final lap and was pleasantly surprised when she picked up the pace toward the end and pushed me to run faster. Good work, Katie! As always, I love NP_NYC and fully support any and all friends coming out. You just have to show up and give it your best effort. No judgment! Tomorrow I’ll run 10 miles at an easy maximum aerobic heart rate pace. Friday is a day off, and Saturday I’ll run two miles in anticipation of the Staten Island Half on Sunday! We’re so close to the marathon now. So pumped.